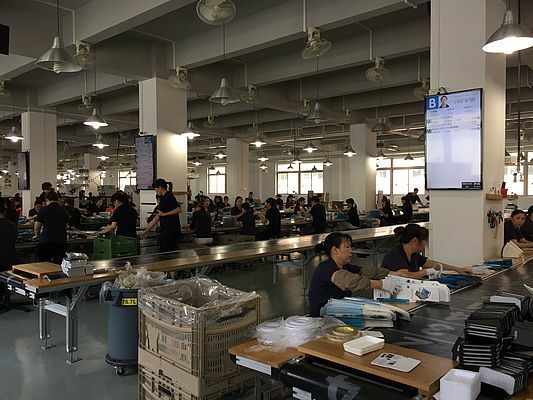 Ash Cloud, a Chinese manufacturer of mobile phone accessories, relies heavily on intralogistics solutions from Interroll when it comes to production and shipping in Shenzhen and thus managed to increase its production efficiency by around 35 percent in the last two years. The company currently produces 35,000 mobile phone cases for the international market each day and manufactures mainly for the European telecommunications industry in Germany, the UK, Spain, Italy and the Netherlands. 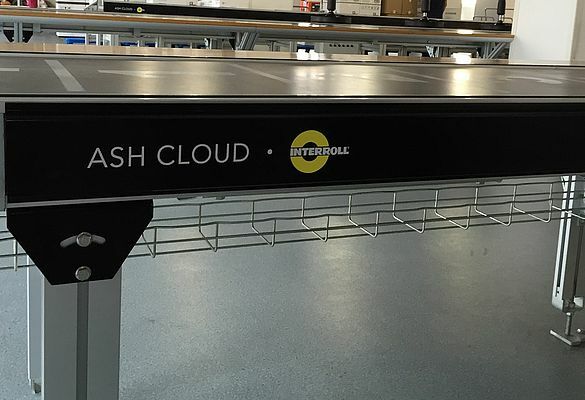 Ash Cloud currently estimates that it has a market share of around 35 percent in this product segment. About two years ago, the company began equipping its 8,800 m² of production area with Interroll belt and 24V roller conveyors to significantly increase efficiency in production and shipping. The aim of the "goods to the employee" approach was to reduce transit times for the employees involved in the production process so that they can concentrate fully on the individual production steps. Workstation ergonomics also plays an important role for the company. According to company founder Fred Chen, the increase in production efficiency and the high quality of the components were crucial aspects in the decision-making process in favor of Interroll solutions. "The basic goal was to make our production faster and more efficient. In my opinion, this is the only way to deal with increasing order volumes that really makes sense. And I put a lot of emphasis on high quality. The Interroll solutions in our production areas work very reliably and are easy to install," he adds. Ash Cloud uses the Interroll belt conveyors at all stages of production, from pre-assembly to the various quality control steps it performs on semi-finished products and finished products and even packaging. Roller conveyors that are controlled by DriveControl and ZoneControl are also used for zero pressure conveying, as well as transfers and merges. The products that Ash Cloud manufactures are thus transported from one production step to the next and finally to the shipping point based on the principle of one-piece flow. The savings in energy costs are also not to be underestimated. For example, the 24V RollerDrive are only driven when goods to convey are found in the appropriate zone. This is not only much more efficient, but also more quiet. Wear effects are also minimized by the demand-controlled operation and the fact that no additional drive mechanism is needed. The cost of maintenance and repairs is lower too because brushless 24V drives are generally less maintenance-intensive than conventional gear motors. Ash Cloud relies on Interroll in the area of shipping as well and has installed pallet flow storage according to the FIFO principle (first in - first out). Interroll flow storage solutions are characterized by their channel structure. The individual channels are equipped with rollers that don't have their own drives. Gravity is responsible for moving the loading unit (e.g. pallets) from input to removal. The loading units "flow" through the channel via slightly inclined roller conveyors.